Do y'all read Cheers Y'all? If not, check her out! 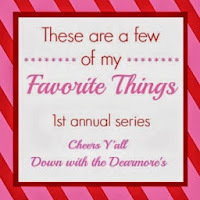 Anyway I'm linking up with her and Down with the Dearmore's, for their Favorite Things link up. I'm sharing my favorite gift ideas for the holidays are! Three: Target // Loving this knit throw, so comfy! Four: Target // I had a set of these years ago, and they were fabulous. Five: Urban Decay // I am one of the few girls without this eye shadow.